Geeksphone's Revolution comes with Android, but lets users switch to Firefox OS with voiding the warranty. The phone is more expensive than phones with similar hardware, such as the Moto G from Motorola, but Geeksphone hopes people will pay the extra for the option of running Mozilla's Boot2Gecko OS instead. Boot2Gecko, also known as Firefox OS, is built around applications written in HTML5. Mozilla Foundation is pitching it as a more open alternative to Android and iOS, better suited to low-end smartphones. Unlike other platforms, content purchased by the user is owned by the user, not tied to a particular device, according to Mozilla. Developers are encouraged to distribute apps however they want, and even to build new app stores that compete with Mozilla's own Firefox Marketplace, it said. The organization will only let carrier customers use the Firefox brand, though, so independent manufacturers have to find another name, even though the OS, features and marketplace remain the same. Geeksphone chose to call the OS Boot2Gecko, which was the platform's project name in development. The Revolution runs Android when first booted up, but users can then choose to replace the Google OS with Mozilla's platform. 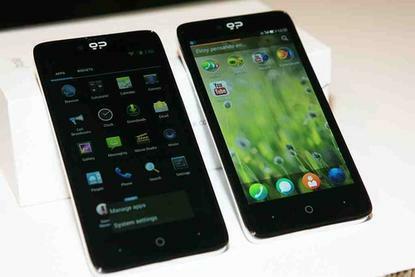 Users will also be able to run other community supported operating systems, Geeksphone said without elaborating. It is powered by a Intel Z2560 Atom dual-core processor running at 1.6GHz, with a 4.7-inch, 960 by 540 pixel screen. It has 1GB of RAM and 4GB of integrated storage, which can be expanded using a microSD card. The phone also has an 8 megapixel camera and a 2,000 mAh battery. The phone has been available in Spain for a couple of days, and can now be purchased for €239 (US$330) from Amazon's stores in France, Germany and the U.K. It will soon go on sale in Italy, and can also be purchased from Geeksphone's website.